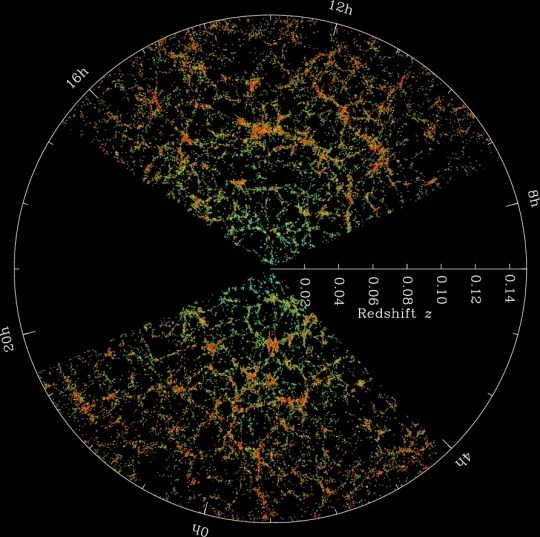 To properly answer this question, we have to drift backwards in time a bit, to understand where the idea that the universe is expanding comes from in the first place. 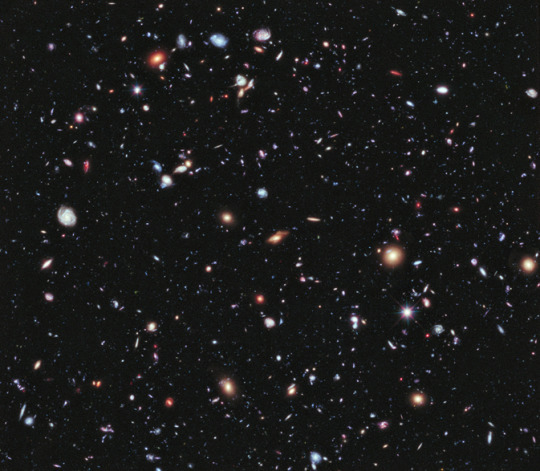 The story really starts in the era of Lorentz and Hubble, when our vision of the Universe’s scale was expanding hugely. Scientists were beginning to comprehend the scale of the universe — the Milky Way was not an isolated entity encompassing all that there was. 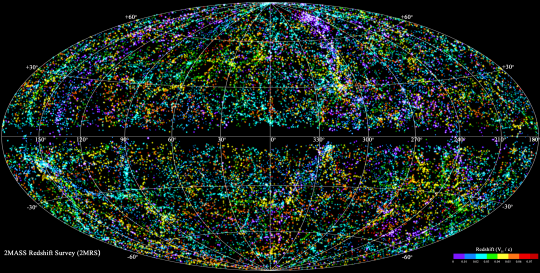 Extragalactic astronomy — the study of things outside our own galaxy — was born in the first decades of the 20th century. We were starting to take measurements of (what we now know to be) other galaxies, trying to determine how far they were exactly. With every measurement that was taken of these spiral and elliptical “nebulae” in the skies, it became clear that each one appeared to be moving away from us. This is a relatively straightforward thing to determine. Galaxies (if they are forming new stars) tend to glow in very specific colors, due to the atoms within them. Hydrogen, for instance, has a very bright, unique pink-red glow, and oxygen glows green in these environments. The colors are due to the exact wavelength of light that the atoms produce when an electron loses energy, and we know these wavelengths quite precisely. If these colors are shifted in any direction from where they would be if you measured them in a lab on the Earth, it means that the object we’re looking at is moving along our line-of-sight. 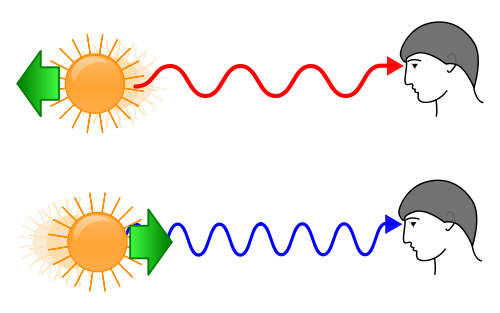 If it’s moving towards us, they will shift towards the blue, as the peaks and troughs of the light wave are pushed closer together, and if they are shifted towards the red, the light wave will be stretched. Cunningly, we have termed this redshift and blueshift. It’s exactly the same phenomenon as doppler shift changing tone of a siren as it passes you. So when we looked out at the night sky, and found that everything was redshifted and not blueshifted, that implied that everything was moving away from us. And if everything was moving away from us, then that required an adjustment to the simple, static picture of the universe. If the universe was in balance, with no expansion or contraction, you wouldn’t expect to see everything else in the universe fleeing from you, as though you’re at the top of a hill, watching everything else roll down a hill away from you. So either the universe wasn’t in balance (in this case it would have to be expanding), or the Earth, our vantage point, was in a special place, like the top of our metaphorical hill. Historically, scientists haven’t liked arguments that mean we have to exist in a statistically improbable location in the universe, and nowadays we have another argument at our sides that argues against this. No matter where we look in the sky, everything looks pretty much the same. Sure, the small things change — there might be five galaxies in a group here, 13 in a group there, but on average, things are distributed nearly evenly across the sky. And, looking at the distribution of things, it shouldn’t matter where we’re standing — if we were in a totally different galaxy, in a vastly different part of the universe, we should see a universe that looks pretty much (at least on a statistical level) the same as ours. The technical terms for this are “homogenous” (the same in every direction you look) and “isotropic” (the same from any point you could be standing). 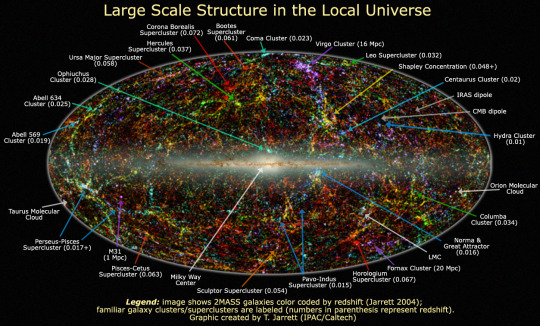 So how would we know if the Universe was expanding from everywhere, or from a fixed point in space? Fortunately, these two scenarios would reflect their changes in both the way we see galaxies moving away from us, and in the overall distribution of galaxies in the sky. If the universe is expanding evenly (our current theory), from everywhere, gradually expanding the space between galaxies, then we would actually expect every galaxy to appear to be moving away from us. If all things are separating, but we are stuck in a fixed location, then relative to us, all things are moving further away. Notably, this would appear to be true no matter which galaxy you happened to find yourself on — you’d always observe everything to be receding from you. If, on the other hand, space spooled out from some kind of vortex over to the left, we’d notice a difference in the way that galaxies were spread in the universe, and a difference in redshifts as we look around at different parts of the sky. Say we’re looking directly at our spooling space vortex, and it’s pushing new space out into existence. That wouldn’t change the distance between our galaxy and the galaxy behind us, away from the vortex. So the galaxy behind us would appear to be stationary relative to us. In fact, most galaxies on “our side” of the vortex would appear to be moving either slowly, or not at all, relative to us. Things on either side of the vortex wouldn’t appear to be drifting forwards or backwards, but they’d have some pretty solid apparent sideways motion — at high speeds, this might drive a measurable parallax, where you could see its motion against the background galaxies. Meanwhile, galaxies on the other side of the vortex would appear to recede from us very rapidly! I said we’d also notice in the distribution of galaxies — and that’s because in this scenario, the vortex is forming empty space; so it’s creating a perfect bubble — an absolutely empty sphere of space, growing rapidly with time. And if we were to take large sky surveys of the galaxy population, such a bubble would surely stand out as unusual. We’ve actually looked for signs that we might be inside such a cosmic bubble (though, clearly, it’s not as empty as the vortex-bubble would be), and so far we’ve found not even a hint of evidence that we’re in one. Instead, measurements like galaxy counts, temperature evolution over time and density measurements out to very large distances point towards the expanding, isotropic, homogeneous universe picture, and not the Earth at the privileged center of a vortex (or explosion) picture. So if there were a cosmic vortex somewhere, spooling out spacetime from a specific point, ultimately we would expect the way we observe the universe to be very different. It’s only because space is being created between all the objects which exist currently that we observe all galaxies to be moving away from us, and our observations that the universe is distributed evenly across the sky, so no matter where we stand, we should see something similar — which wouldn’t hold if there were a giant vortex in the sky.